I’ll loan him my shovel. Is it a Golden shovel? Better loan him a bulldozer! On second thought I think Mr. Golden should use my shovel and go finish the community center at Marine Park. on his agenda of things to do?? boy i am sure all of he citizens hope that that 1 opal property gets taken care of. when he accomplishes whatever he might then everyone will feel relived and their lives will improve dramatically. oh oh i get it first you were for me until you were against me. According to the Dept of Finance web page…Taxes have been paid for the first qtr. on 1 Opal..It is not a derelict or abandoned property..While I agree it looks like hell, It will take more than Golden to have it torn down. The taxes may have been paid for the 1st qtr, but that doesn’t mean the building can’t be torn down if deemed unsafe. It certainly looks derelict and abandoned to me! It does not matter what it looks like to you, unless you are a certified building engineer..The Buildings Dept will determine what the owner should do and/or make the necessary repairs for safety sake and bill the owner.The City is not in the business of tearing down taxpayers property..
I’m not a certified building engineer, but it does matter what it looks like to me and it looks like crap! Property left in that condition lower the value of all our houses in the area. I never said the city would tear it down. But let me clarify here. As long as the property taxes are paid and the mortgage is paid or satisfied, the city cannot enter the property without the consent of the owner. If the owner consents and the city deems it unsafe and in such poor array that it cannot be fixed, they will tell the owner it has to come down at his/her expense. One other thing to think about…when more and more houses are left in this condition, slums are usually the outcome. GB is not a slum and is far from being a slum, but it gets closer to being a slum when houses are left to rot! Oh I don’t know, a little paint, spackle and some new curtains! You would never recognize it. know before you speak it is the officials who are not being respectable leaders for the working class. You think it’s such a palace, YOU buy it! Give me a price ? here we go if the person who keeps taking my posts down does not do the same with this article i am going o cause more trouble than he can imagine. you have no idea the absolute big problems that golden created. i will have everyone know his house is not abandoned. i paid 26 thousand dollars for an architect to draw up plans and he instead assaulted me. never gave me he plans i paid for . this is to be argued in court. there are also legal issues with he bank who has not produced the note and has recording issues to be dealt with in the u.s. supreme court. this architect lives in the beach and he also worked for the dob for 15 yrs. my family lived here and all of our things have been cemented in this home that i can nott enter until everything is dealt with in court. they estimated. shutting off the electric. there has beeh no appliances or anything and it was paid for until the end of aug. cemented in sept. and billed until dec.
now i have teenagers breaking in and i am getting violations for this. i have managed to get them dismissed before the wonderful marty did his photo op promising whomever this would make happy to get rid of my home. just wait until you have a problem- what kind of help will you get?? you want my home– then come up with the money i paid for it and i will still say no. if these neighbors do not like that then wait until i have to sell it and then see if you like your new neighbors you bunch of trouble making little wining golden fools. To go back to my original point.Golden coming around for a photo op.means nothing.The house is a work in progress.And I am sure the owner will be notified..The owner already owes the City close to 5000.00 for past work done by the Buildings Dept. For emergency repairs.Nobody is calling GB a slum. Sometimes buyers over extend themselves and bite off more than they can chew as in ’07-08 when this was bought I am sure that they intended to finish the work. And are probably just as unhappy as you are at its appearance. I agree that Golden’s photo op means nothing. But as you stated, the owner owes the city close to $5000.00 for past work done. This has been going on for 3 years now! If the owner can’t pay the $5000.00 then the owner can’t fix the property! Finish the work? WHEN? BTW, I didn’t call GB a slum, I said that this is how slums start! First rule of buying property…DON’T BITE OFF MORE THAN YOU CAN CHEW! Not to go to far off topic you will of course remember the mess created by Fannie Mae,Freddie Mac Countrywide Mortgage and many others in ’04-08.No money down big loans,No job ,No problem loans which proceeded a real estate crash that will take years to straighten out.I, like you sound, would not have over extended my affordable level for a house.Some just thought it would go on forever.Only when these balloons burst, do people wake up and realize they got left holding the bag,or in this case the house..I saw this in the 1980’s when the Government set up the Resolution Trust Company,took all of the bad Real Estate from the Savings & Loan Co’s and tried selling it off. It took them about 15 years to solve that burst bubble..When this one will end or how is anyone’s guess. It all seemed so simple 8 years ago.You just bought and waited until your value increased..Then you sold and bought more expensive..I hope this property can be made viable again. I thought the first rule of buying property was location, location location. Nope! That’s the first rule of owning a real estate office. bite this and chew on it . the 5000 is for the wind blowing off the covering on the home during a storm and then them not answering my phone calls to try and obtain their help and information. they need money and they chose to tell me to wait for the inspector to call back at he same time they cemented it shut. so look this way while they do something the other. i want to fight these charges too. i had the case dismissed -i had already paid someone to do it. calling it abandoned simply because the permit ran out. go on vacaion le he litttlke buggers figure it out and youy too could have violations on your property for being left open and unguarded. this home is subject to inspections nearly monthly. it is closed and sealed properly. boards- cement and all- will your home be this closed up when you go on vacation?? they broke off a side of my home to gain access first hey cut through the fence. now the boat is gone it will not deter them hey will just break in. well i won a million dollar lawsuit and you tell me how you can sit and judge who is what and how. then look at your opportunity to change it now. maybe i am not going to get that money what do you think?? there are many issues like his that i have been completely side swiped. anyway if you really care what is going on with my home there it is before i gets erased again–my t’s are sticking so if something makes no sense stick a t somewhere in it. make me sell my home because someone is breaking into it or maybe the city has tyrannically imposed charges that are beyond belief or maybe because i can not plug in lawn mowers or weed wackers. really his is your big campaign effort marty. oh i get it- it would be easier to promise my home- maybe someone he knows wants to have a chance at my home since i have been a begging fool for justice and the money ha belongs to me. your vile and disgusting and i am the working class. how dare you have your office call my home and ask me why i do not get a job and sugges somehow it is my faul that hese children are breaking into my home at my fault therefore i should just give in and sell it. love the way people know how long it has been like this so do you think i should let he real estate sell it since they probably have a more worthy bottom feeder. my husband is in he union and i choose to say at home with the kids and be a housewife. worry about idenity theft and crime and stuff or are these issues not as easy since you think i am just a defenseless idiot. If that were my house I might be talking to my lawyer. 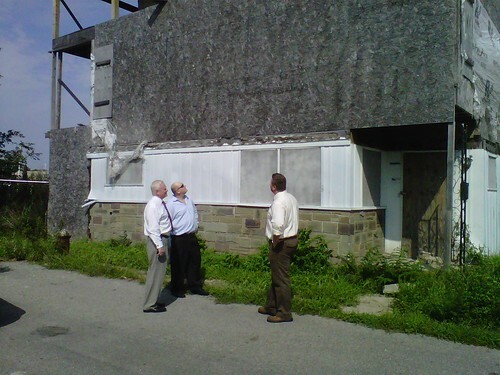 How dare Marty stand in front of someone’s property with the DOB, call it derelict and post it on the net. I bet he never met with the owner to discuss what the problems are with the property and what can be done to fix it. From the picture, I’m pretty sure you wouldn’t have a case. 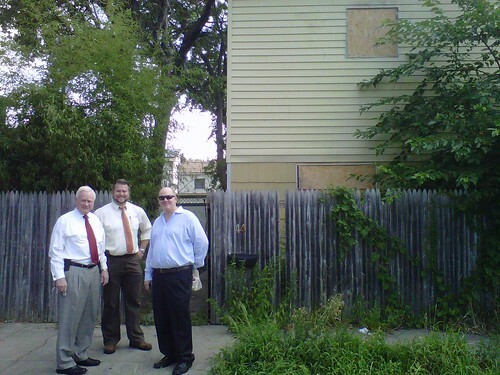 Why doesn’t marty golden come over to this side of the canal and pose in front of the lacon court fiasco that has been going on for years…It’s about time that somebody at government level became involved in this ongoing blight on this neighborhood…..
wow, glad I don’t live on your block. I can’t stand the 311 calling, nosy busybodies around here sometimes. How awkward it will be for you when they finish it and move in. It annoys you? How do you think they feel? It’s a shame that they couldn’t finish it, whatever the reason, whatever miscalculations or mistakes, I’m sure they wish they could complete it and move in, well maybe not so much now that they know their potential neighbors better. Wow, Anonymous I’m glad you don’t live on my block either. To call someone a busybody for reporting of vacant home that’s apparently in disarray, obviously doesn’t understand what’s involved. If I lived on that block it doesn’t matter to me why the house is vacant and an eyesore, only that it is. It doesn’t take long for a vacant house to attract mice, rats and all kinds of animals. If what you said about the owners of that house is true, how much money does it take to keep the landscape in an acceptable manner not to make the house seem derelict. I don’t know the owners but it’s fair to say that they may be investors, similar to ones that were working on the house that collapsed a few months back, and just stopped renovations when the housing market went south . Sorry, Trainman, I disagree. I don’t know the owners either, but I do know that their intention had been to move in. Your assumption that they were investors is incorrect. The neighbors must ave already gone through a round of complaints and had the buildings dept come and seal it up against animals and bill the homeowner for the repairs. If the neighbors tried talking to the owner and didn’t get a response then reporting to the DOB was their last resort and right. The owners have been billed and fined. I think it is mean of the neighbors to not be satisfied with that and bring Golden into it, post it on this website. It is someone’s property. They pay the taxes. Certainly, there are actual occupied houses in the neighborhood that don’t look much better. That’s their business. Who appointed AnnemarieMinze the judge and jury on which houses are ‘annoying’. I am ‘annoyed’ by some of the too big, stuccoed monstrosities, but beauty is in the eye of the beholder and it is a persons right to do what they want with their property within the law. What is in such disarray anyhow? Weeds? Lol, we all battle those all summer, it’s amazing how tall they can get after a day or 2 of rain. Lighten up and stop dropping dimes on your neighbors, if this is your biggest problem you should be grateful. Well, Anonymous I bow to your firsthand information on this subject. I came to AnnemarieMinze defense because it seemed like you were getting a little too personal in your attack towards her. I don’t know Annemarie personally but I do know of her from Resurrection Church. I had a similar situation on my block a number of years ago when a house whose owner died and the children, who no longer lived there, could not or would not agree on what to do with the house. So there it stayed lingering in disrepair for what seemed like many years. One day a construction company arrived at that location and started to disassemble the house. With the roof almost gone, you may not believe this, they discovered they were on the wrong block and that house was not the one that’s supposed to be taken down. And there it lingered for another couple years with half the roof gone (you could only imagine who or what was living in there) and one day someone purchased the house and build a three-story rental property. Not an ideal situation. Regardless of the reason, how long would you find it acceptable for a house to stay empty on your block before complaining? Trainman, I have had two houses left to rot on my block also. On one, the roof was intact so there was no water damae and the new owners were able to renovate it in a short matter of time and move in. The other house was in very poor shape…half the roof rotted away, broken windows..ect! I can attest that property left in that condition attracts all kinds of vermin. As soon as the new owner started to tear it down my house as well as others were overrun with mice. Property left like that is an eyesore, but i’m no busybody and would never call 311. Whether I know the owners situation or not, it’s not going to get the property rebuilt any faster. In fact, I believe calling 311 would only delay the renovation process because fines would be issued and would have to be paid before any further work can be done. I wrote the above and tried to get people to have a bit of understanding of what the owners of this house were obviously going through. Until you have had to deal with City agencies and DOB, you have no idea how frustrating it can be. Well, karma being what it is, I guess your learning now. I’d venture to guess that a lot of these 311 tattle tales houses don’t look much better at this point DOB wants 25k just for the permits to raise them. Marty could spend weeks going around every day at the multitude of houses that are gutted, abandoned, useless. BIB is a joke. It’s own bloated administration will soak up most of the money. And speaking of karma, Washington, Illinois is represented by Congressman Aaron Schock. He has voted against every attempt to curb pollution and global warming. I, of course,completely feel the pain of the people who are devastated there but Congressman Schock voted against aid for Hurricane Sandy. the smell is the water contaminated with human feces from TGIF and others purposely ignoring to fix the problem. This is going on for years and since your such a nice person ann marie I hope you have swam in it and caught a disease that would explain your ignorance. I have seen a lot of new homes built over the past few years in GB, how come that doesn’t get posted? with all the negativity about the neighborhood, it’s a wonder more people don’t move out or other people would move in! If I lived in another area and read the post on here, i’d stay away and look somewhere else to live. I believe it would help if GB.NET would follow up on their news and let people know the outcome of the situations. That looks like one of the Houses I worked on a few years back. Maybe even my old rental house. KD Contracting used a little Spackle than some Paint, job done. We were the House flippers before it became the rage.When you wanted a Quick Cheap job or wanted to sell and cover the years of wear,all you did was give Kevin a call. We have a waterfront property home on Beacon Ct.thats full of raccoons. It was a beautiful house, until an oriental man bought it and never moved in over about 7 years ago. The raccoons don’t even have to climb through the attic hole anymore, cause they can walk right in the hole by the front door! Anybody would love to have this property, but the only residents are weeds higher than the roof, poison ivy and raccoons!What can we do about this situation? so buy it or call your neighbor and let him know that there is a hole. I am sure he would love to know and be willing to fix it. Any one notice the NEW breed of mosquitos that are coming out of the lacon ct properties,my belief is their breeding in all the deralick boats that are full of stagnant water and God knows what else left there by our new friend and neighbor FAT IZZY.these things are nasty,they look like zebras and pack a nasty bite.try and stand out there and your swarmed .Lyme disease for all !